The South Australian Chamber of Mines and Energy (SACOME) is supportive of a State Government Energy Plan released today that has energy security and reliability at its core. The plan addresses many of the concerns South Australian businesses have as they attempt to remain competitive in national and global markets. Ms Knol says battery storage is a key in addressing an inherent weakness in the renewable space. “It is envisaged that storage technology compatible with South Australia’s generation mix will assist in reducing price and volatility of electricity supply. We welcome the introduction of storage technologies that can transition renewables from intermittent to dispatchable energy sources and potentially place downward pressure on wholesale electricity prices while improving system security. “As outlined in SACOME’s recent submission to the Finkel Review, we applaud market mechanisms to ensure energy security and affordability. Our facilitation of an application seeking authorisation from the ACCC on behalf of a ‘buying group’ is aimed at increasing market competition and applying downward pressure on prices –and today’s announcement supported this concept. SACOME will continue to work with the SA Government to ensure South Australian industries are able to access energy at a globally competitive price. 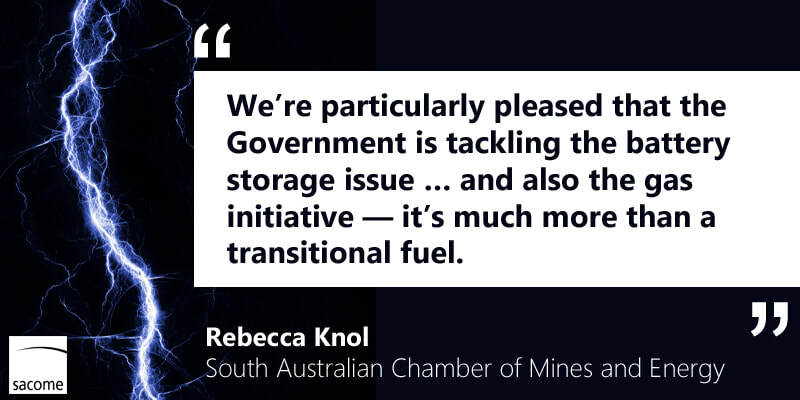 “SACOME has been working with industry and the Government to initiate change in the energy market and we look forward to continued dialogue on these proposed reforms,” Ms Knol said.